... and so this guy is born....! A highly secretive breed of duobot with unknown name, is the Autobot's counterpart to the Decepticons Duocons. 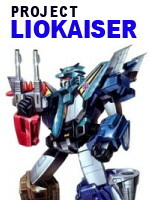 He is the minion of the even more mysterious Autobot named [Project PX] . Duobot splits into 2 vehicles: A tank and a jet plane. Both played important roles in protecting [Project PX] from surrounding threats. If you came from mocpages.com earlier, a quick sneakpeek of [Project PX] is shown at the bottom of this blog entry.